India and Sweden will also jointly organise the India-Nordic Summit in Stockholm tomorrow. The summit will also be attended by the prime ministers of Finland, Norway, Denmark and Iceland. Prime Minister Narendra Modi today arrived here in the capital of Sweden, the first bilateral visit by an Indian premier to the Nordic nation in 30 years. Swedish Prime Minister Stefan Lofven received Modi at the airport. Modi is on the first leg of his five-day foreign tour which will also take him to the UK where he will attend the Commonwealth Heads of Government Meeting (CHOGM). "Scripting history! 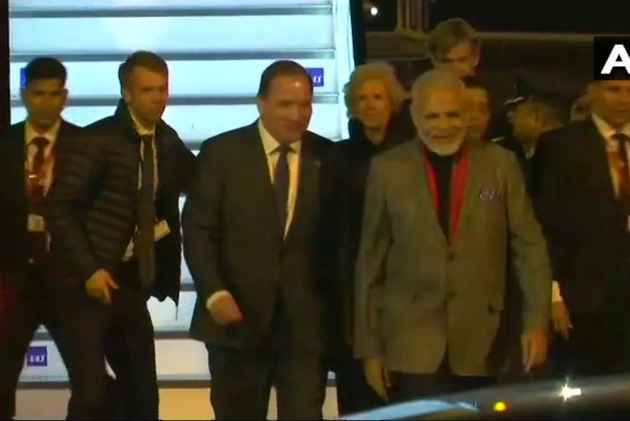 PM @narendramodi arrives in Stockholm on a first bilateral visit by an Indian PM in 30 years to a warm and personal welcome by @SwedishPM Stefan Lofven at the airport and to participate in the first ever India-Nordic Summit," Ministry of External Affairs spokesperson Raveesh Kumar tweeted. Modi and Lofven also travelled together in the same vehicle from the airport to the hotel, he said. Earlier, ahead of his visit, Modi said in New Delhi he was looking forward to deepening bilateral engagement with both countries in a number of areas including trade, investment and clean energy. "India and Sweden share warm and friendly ties. Our partnership is based on democratic values and commitment to an open, inclusive and rules-based global order. Sweden is a valuable partner in our development initiatives," Modi had said in a departure statement last night. The two prime ministers will hold bilateral talks on Tuesday. Modi said he and Lofven would also interact with top business leaders of both countries and chart out a future roadmap of cooperation in sectors such as trade and investment, science and technology, clean energy and smart cities. The prime minister said he would also call on King of Sweden Carl XVI Gustaf. From Sweden, Modi will later tomorrow travel to the UK where he will also attend the CHOGM, besides holding bilateral talks with his British counterpart Theresa May.